An attempt to decriminalize possession and consumption of cannabis failed narrowly in Parliament in 2004. 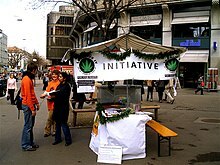 As a reaction, a popular initiative ("Eidgenössische Volksinitiative für eine vernünftige Hanf-Politik mit wirksamem Jugendschutz") to amend the constitution to legalize cannabis was introduced 2004. On 11 September 2018, a parliamentary initiative by the Green Party, that demanded a law on regulation of cultivation, trade, recreational consumption, youth protection, and taxing of cannabis, was rejected in the National Council by 104 to 86 votes. Meanwhile the "Legalize It" organization is preparing a second popular initiative originally set to launch in April 2018. Consumption of soft drugs in normal cases (first infraction, or minor quantity, or brief period of consumption) Fine of 100 CHF or more (depending on the accused's financial circumstances). Consumption of soft drugs, repeated infractions Increasing fine or monetary penalty (depending on the severity of the infraction and the accused's financial circumstances). ^ a b "'Cannabis clubs' set for four Swiss cities - The Local". Thelocal.ch. 2016-11-18. Retrieved 2016-11-23. ^ a b c "RS 812.121 Loi fédérale du 3 octobre 1951 sur les stupéfiants et les substances psychotropes (Loi sur les stupéfiants, LStup)". Admin.ch. Retrieved 2016-11-16. ^ a b Eidgenössische Volksinitiative 'für eine vernünftige Hanf-Politik mit wirksamem Jugendschutz', admin.ch – Swiss government, for results see: "Abstimmung Nr. 538". Retrieved 2013-09-05. ^ de:Eidgenössische Volksinitiative "für eine vernünftige Hanf-Politik mit wirksamem Jugendschutz"
^ "Swiss approve prescription heroin". BBC News Online. 30 November 2008. Retrieved 30 November 2008. ^ "FF 2012 7539" (PDF). Retrieved 2016-11-16. ^ "Justice: Le TF annule le concordat latin sur la culture du chanvre - Suisse". lematin.ch. Retrieved 2016-11-16. ^ "Cannabis, Einbürgerung, Führerausweisentzug: Das hat der Nationalrat beschlossen" (in German). aargauerzeitung.ch. 2018-09-11. Retrieved 2018-09-14. ^ "Bundesgesetz zur Hanfregulierung (neues Schweizer Hanfgesetz)" (in German). Retrieved 2018-09-14. ^ "Hanfgesetz ist im Nationalrat chancenlos" (in German). blick.ch. 2018-09-11. Retrieved 2018-09-14. ^ "Im Bundeshaus startet die grosse Cannabis-Offensive" (in German). AargauerZeitung.ch. 14 December 2017. Retrieved 2017-12-30. ^ "Der Nationalrat sagt Nein zu Cannabis-Studien – das würden sie für die Schweiz bedeuten" (in German). nzz.ch. 2018-06-11. Retrieved 2018-09-14. ^ "Bundesrat will Cannabis-Pilotversuche ermöglichen" (in German). nzz.ch. 2018-07-04. Retrieved 2018-09-14. This page was last edited on 26 November 2018, at 18:09 (UTC).